Alpacas are gentle, rare animals that are exotic and raised for their exquisite fur or "fleece." Their fleece is shorn each Spring, causing no harm to the alpaca. This fleece is extremely soft and strong and used for everything from hand-spun yarn to the most expensive coats and garments. Alpaca fleece is exquisite; that's what all the fuss is about, alpaca yarn, alpaca blankets, hats, coats, toys, stuffed animals. It's one of the softest natural fibers on earth. There are 22 recognized colors of alpaca fleece, and quality fleece is the goal of every alpaca farmer. The value of the fleece is in its comfort factor—soft, light and insulating. A product that is a hand spinner's delight. Alpacas originated in the Andes Mountains of South America, in the countries of Peru, Bolivia, and Chile. They have been exported all over the world. Alpacas were first imported to the United States in 1984. Later the US alpaca registry (ARI or the Alpaca Registry, Inc.) closed to alpaca imports, thus protecting the US market. This has kept the value of alpacas strong. There are two types of alpacas: huacayas (pronounced wah-kai-yahs) and suris (pronounced su-rees). Huacayas have crimpy, dense fleece similar to a sheep and suris have fleece like hair that hangs in twisted locks all over their bodies. Suris are more rare than huacayas. We raise huacayas here at Alpacas All Around. They both weigh generally between 100 to 150 pounds when full grown, and their heads are about at eye level or slightly below for most adults. Alpacas are related to llamas and vicunas. They are much smaller than llamas. The easiest way to tell the difference between the two is to look at their ears. Llamas have curved, banana-shaped ears and alpacas have spear-shaped ears. Llamas have many different types of fleece, single-coated, double-coated, many with a great deal of guard hair. Alpacas have been raised by the Incan Indians century upon century continually refining their coats to achieve a blanket whose guard hair is almost as fine as the fleece itself. Yes, they DO! But usually they do so with each other over food or to ward off an amorous male, when the female is not receptive. Some alpacas spit more than others. Spitting is a trait than can be removed from future generations through breeding selections. Some breeders make breeding selections that include a consideration of temperament which seems to pass down from one generation to the next. 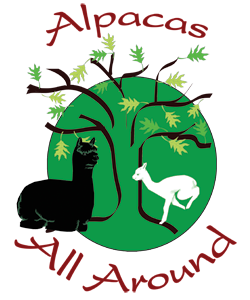 ​The Color Chart with the different colored strands of alpaca fiber can be purchased from the Alpaca Owners Association. You'll want to consult an accountant to get the exact details of how you might benefit from investing in alpacas or operating an alpaca farm. If you can establish within a period of years that you are a for-profit farm and not a hobby farm, then you can depreciate 100% of your alpaca purchases over a period of six years and many other expenses are straight deductions such as feed and veterinary care. If you are an investor and you board alpacas at another farm, then your expenses can be deducted from your alpaca income only and not from your other income. Fencing, shelter and other property improvements can also be deducted or depreciated. The American dream of living on a profitable farm can be realized through raising these gentle, magical creatures. Do you live in a place with bears, mountain lions, coyotes, wild dogs or other wildlife to protect them from at night? You might want a barn that you can enclose them in. How do you want to be able to catch them for veterinary care? Every paddock should have a small "catch pen" that they can be herded into. You might consider having fields connected by a central enclosed area or a long corridor leading into several different pens. How do you want to provide water? The nicest way is to have automatic waterers that pipe in fresh water, refill automatically and are heated to prevent freezing in winter. There are a variety of hay feeders ranging from rubber tubs to large, covered stands. It would be a choice of preference and how the hay can be protected from the elements with your particular setup of shelters and fields. Alpacas need annual vaccinations and routine worming suited to the area of the country that you live in. You can work out a schedule with your veterinarian. You will need to trim toenails and sometimes teeth, periodically. Once a year in the springtime to prepare them for the heat of the summer, they will need to have their fleece shorn off. We have found them to be easy to raise, wonderful to care for, and a delightful addition to our lives. To find out more about alpacas, schedule a farm visit!